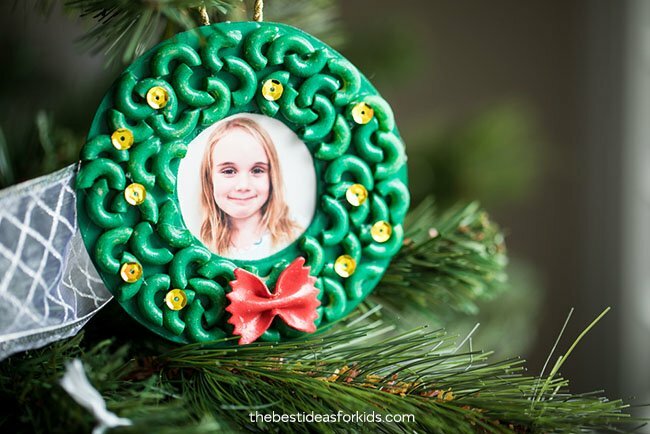 Did you ever make ornaments with macaroni or pasta noodles as a kid? I remember doing this craft and loved placing all of the macaroni on the ornament. 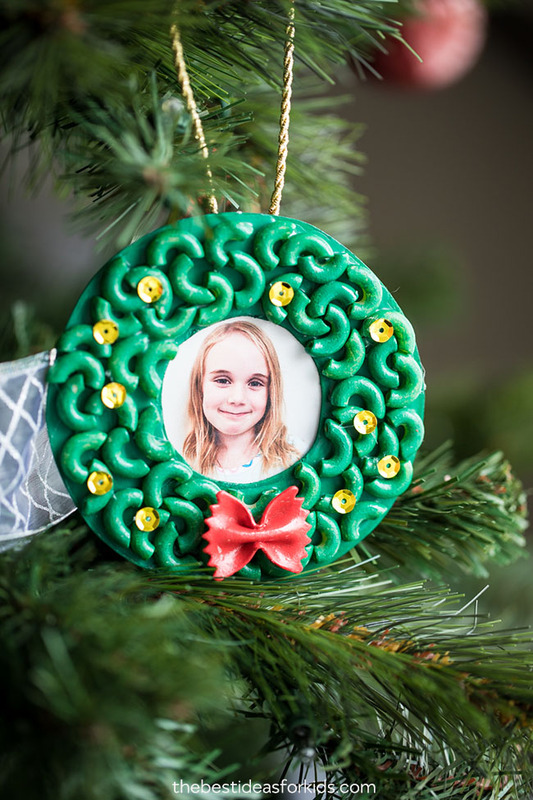 We are sharing today a little twist on the classic pasta Christmas ornaments. Turn your macaroni into a wreath or a Christmas tree. 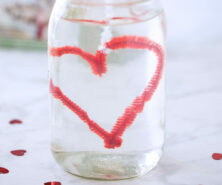 You just need a few supplies to make this craft! 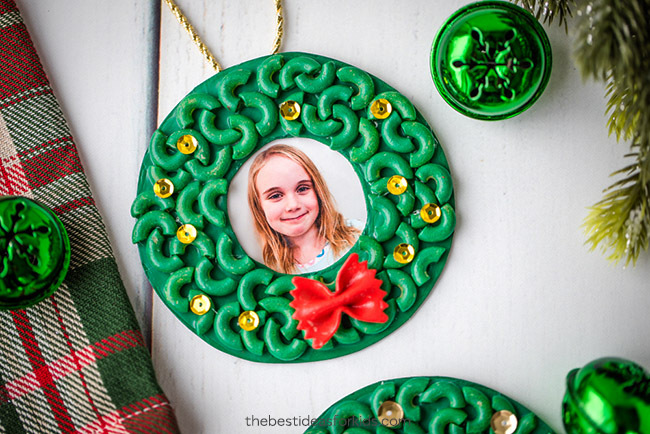 You can make any ornament shape with pasta noodles! Don’t let your creativity end here. You can make a candy cane, a bell, a Christmas tree (see the full tutorial for a Christmas tree here) and so many other shapes! Grab some Christmas cookie cutters and you’ll be all set to make different shapes and sizes. 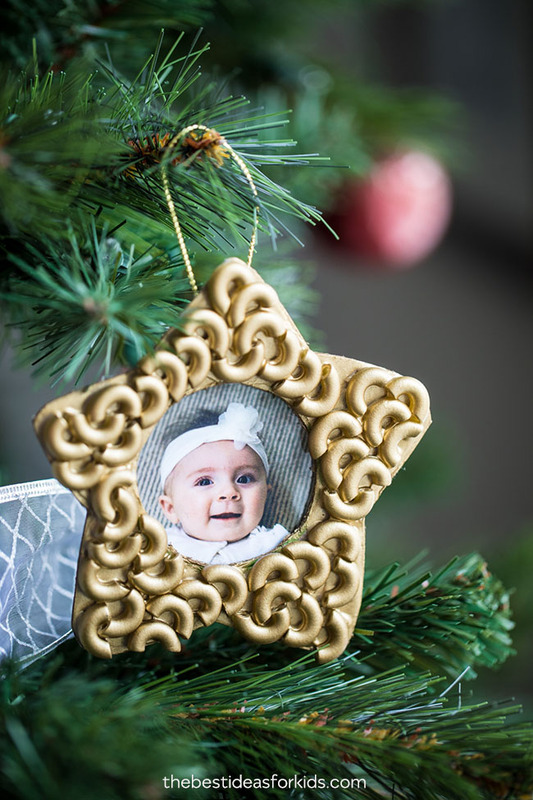 If you have to paint a lot or think the painting will be too difficult for the age of your kids, you can have kids glue on the macaroni and then spray paint all of the ornaments when they are done. Alternatively, if you want to paint the noodles in advance for kids, put a bunch of noodles in a bag and squirt the paint into the bag. Then squish the bag to evenly distribute the paint. Once the paint has covered the noodles, take it out of the bag, separate them, and lay flat to dry on some wax paper. 1. First paint your noodles. You can paint them individually or place them in a bag with some paint and squish the bag to cover the noodles. You can also have kids place the macaroni on the ornament base and spray paint them all when done (adults only). Paint one bow tie noodle for the wreath. 2. 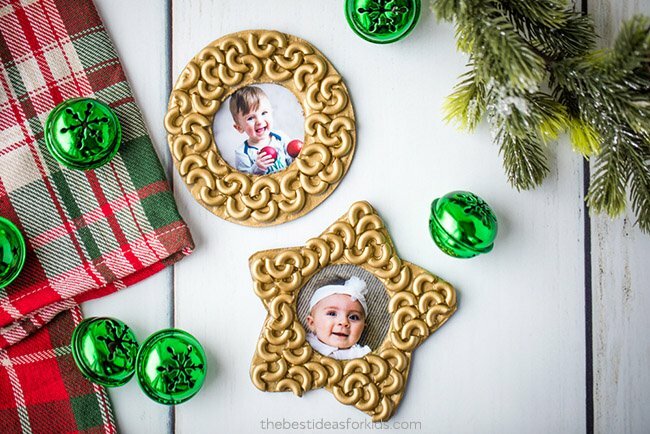 Cut out your ornament from a cereal box or similar cardboard using cookie cutters. We used two circle cookie cutters to make the wreath. You can also trace around any round objects you have as long as you have a large and smaller circle. Add a hole punch to the top of the ornament for hanging later. 3. Paint the cardboard green for the wreath. If you are making other shapes, paint the backing to match your noodles. You may need to paint a few coats. 4. Glue your macaroni to the cardboard shape. We like to use this glue for gluing macaroni. It is non-toxic and extra strong. 5. Add a bow tie noodle on top to the bottom of the wreath. 6. Glue some gold sequins on top. 7. Tie some gold twine for hanging the ornament. If you forgot to leave a hole for hanging, you can hot glue the twine to the back of the ornament. 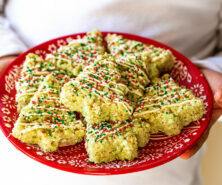 We love how easy these are to make! Kids will love painting and gluing the macaroni for this craft. My kids even loved picking out the cookie cutters and painting the cardboard shapes. 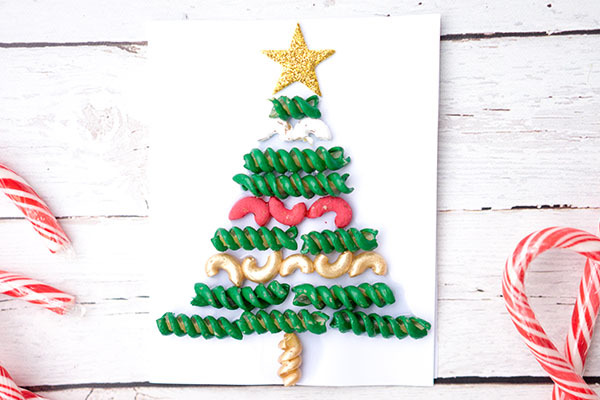 See how to make these Christmas tree pasta cards which can also be made into ornaments too! 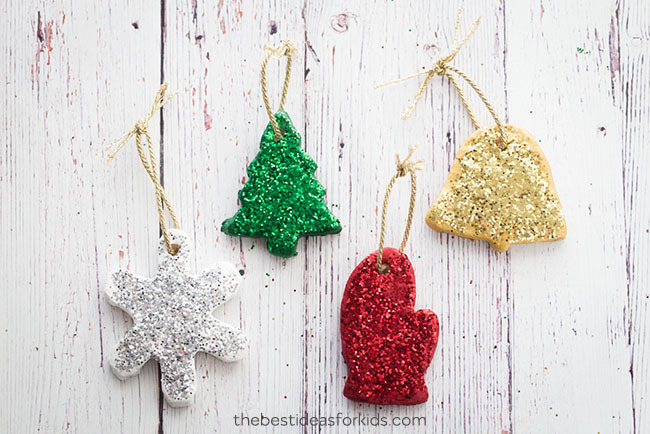 These salt dough ornaments are so fun to make! 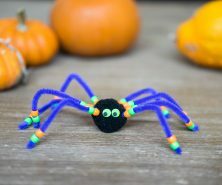 Kids will love helping to make these. 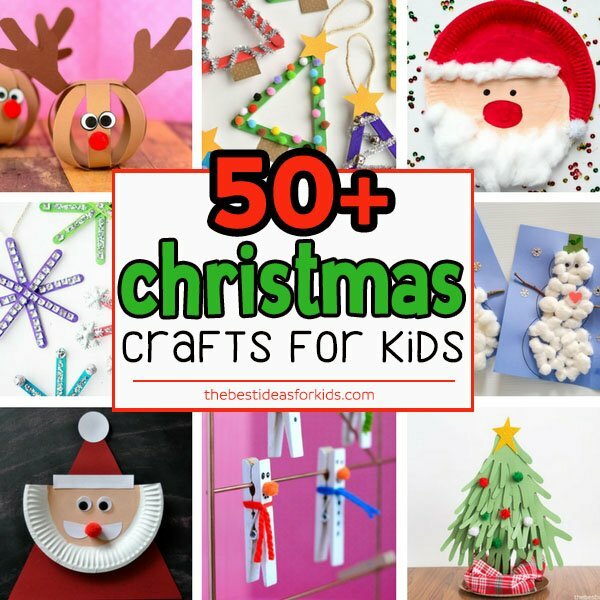 See 50+ Christmas Crafts for Kids – there are so many fun craft ideas for Christmas in this post. I am eager to try some of these crafts with my preschoolers from my daycare.